America, along with the rest of the world, has fallen in love with poker, especially Texas Holdem Poker. Texas Holdem is everywhere. It’s on TV, it’s in your local casino, and it’s on the Internet. But how do you learn how to play Texas Holdem. And how do you learn to not only play the game, but also excel at it and make money. 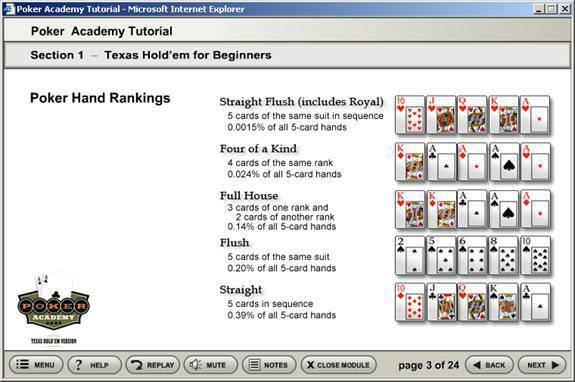 There are a lot of options for learning Texas Holdem. You could go to your local casino or log onto an Internet poker site, and learn by making mistakes. But that’s very slow learning, and each of those mistakes could cost you a lot of money. You could play the free money games at online poker sites, but you would soon realize that that’s not real poker because the players don’t play as if there were something at stake. You could acquire one of the thousands of poker books available in bookstores, but which book is the best, and at what level should you start? The answer is Poker Academy Professional 2.0. With instruction and analysis that can help players ranging from the greenest beginner to a seasoned casino player, Poker Academy Professional 2.0 allows players of any level practice and improve their game. 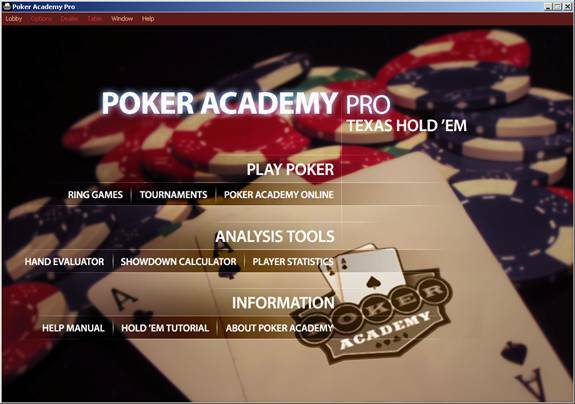 For beginners, Poker Academy Professional 2.0 includes a Texas Holdem Tutorial that begins at the beginning lessons of the game. The tutorial takes the beginning player through the rules of the game from Hand Rankings through how the blinds work to the importance of position and bankroll. More advanced players will probably skip the tutorial and go straight into the training aspects of Poker Academy Professional 2.0. Players first choose if they want to practice at Ring Games or tournaments. Ring games include an almost unlimited amount of game options. Ring game option in both limit and no-limit poker include beginner to advanced tables, full ring games, short-handed tables and heads up matches. From there the user can select the stakes he wants to simulate, what the starting bankrolls are, and what House Rules they want to play under. House Rake options include live casino style rules, along with many online poker room rules such as Party Poker , UB , Poker Nordica , Full Tilt Poker and PokerStars . You can adjust the settings for your favorite level game at your favorite setting, be it virtual or real life. While the table settings are completely in the users control, there are even more options when it comes to the competition available at those tables. 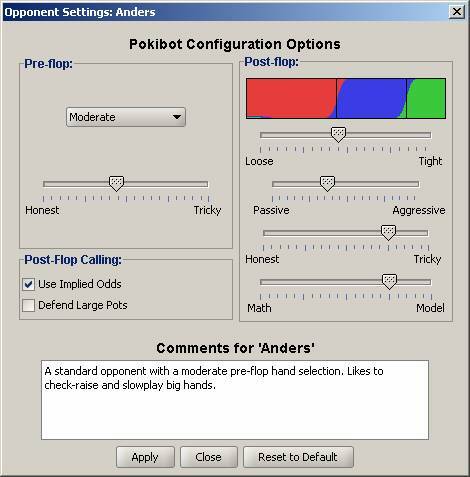 This poker software really shines when you examine the Artificial Intelligence (AI) involved in the computerized opponents. It comes with a number of AIs, including the well-known Poki (which is the AI licensed to Stacked software for the Sony Playstation Games), to provide a variety of playing styles. Also included are two AIs specifically designed for heads-up play, and adaptive AI according to the table. Poki will play differently in short-handed play, as it has been specifically trained for this. There are a number of preset tables to mimic variables from low-limit style play through tough and tricky play for higher limits, from 6-Max to full ring games. Tournament options include Single and Multiple game tables using rules from popular online poker rooms, WPT style tournaments and even the World Series of Poker Main Event. The WSOP option can be configured with up to 8800 opponents. 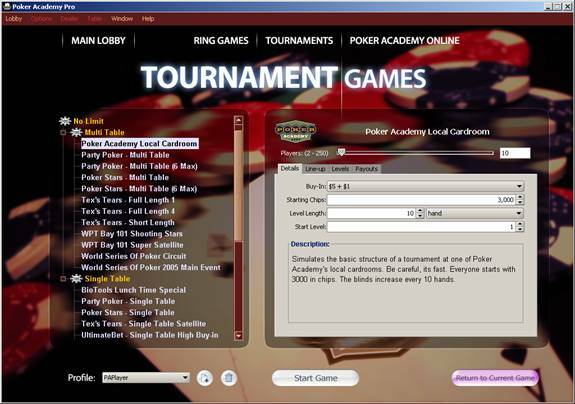 Also available are Single Table tournaments from UB and Limit tournaments in various styles. The tournament games section gives you opportunity to simulate real tournament situations, allowing you to gain tournament experience without paying those expensive buy-ins. Aside from just playing experience, you can train specific situations, and have it deal them to your heart's content. For example, you could train hands with a Jack, from any position or just one position, or you could ask it to deal hands within the top 25% of hands, or you could ask it to deal only pocket queens against a flop with an ace in it, and test out different approaches, etc. Throughout every hand of every game, the Poker Academy Professional Advisor is there to give advice on each hand. There are many options available for Poker Advisor, and each option is completely configurable. After playing in all these situations you can examine your play using the included Player Statistics analysis tool. You'll get a ton of stats and graphs on your play, including your luck, enabling you to analyze your play in simulated conditions without losing a cent. 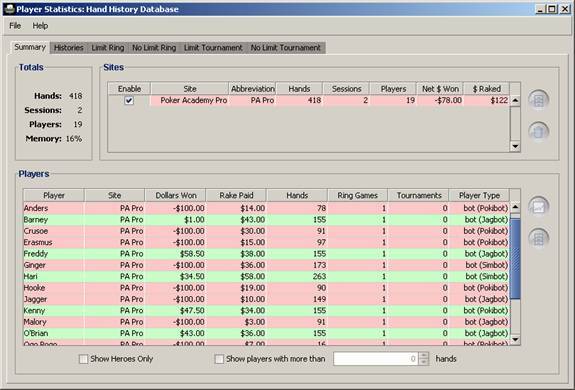 If the analysis tools of Poker Academy Professional are not enough, gathered statistics can be exported to Poker Tracker for further analysis. 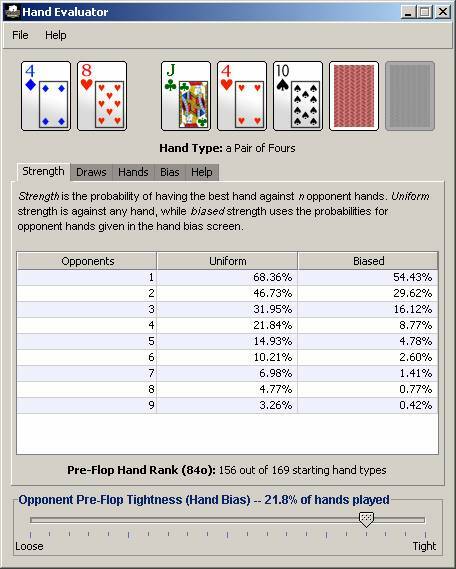 Also included is the Poker Academy Professional Hand Evaluator, which will give you statistics on any possible hand combination, including drawing odds, possible hands along with the likelihood of hitting those hands, and the ability to adjust the probable holding of your opponents, called Hand Bias. Another tool included is the Showdown Calculator, which can simulate up to five million instances of a certain competition’s outcome. It can also enumerate the total number of possible outcomes of any situation. Poker Academy Professional V2.0 is the first release since V1.5 and includes many improvements, the largest and most visible of which are the multi-tournament support, the online play, and the revamped stats. The multi-tournament tables are completely customizable, and one can find a number of presets to simulate up to a full WSOP behemoth event. There is a sidebar that includes a panel showing tournament standings, though the panels can all be minimized and maximized according to one's desires. There are a number of new presets as well for those who play sit and goes (SNGs) at Party Poker and others so that you can simulate an event with the same prize structure, rake structure, and starting chip counts. Thanks to the new stats, you will be able to also see how you do specifically at these events, compared to others. 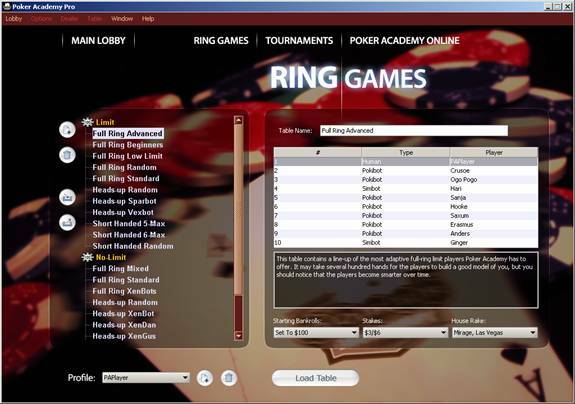 Ring games have a few more presets as well, such as a specific low-limit table with bots set to simulate the play of micro-limit and small stakes play, as well as random table settings. Furthermore, in honor of Ed Miller's book “Small Stakes Hold Em,” there is a bot set to play according to his opening hand advice. As before, one can create one's own tables with types of play, players, custom name and save them, but now one can also export and import settings to share with other users. 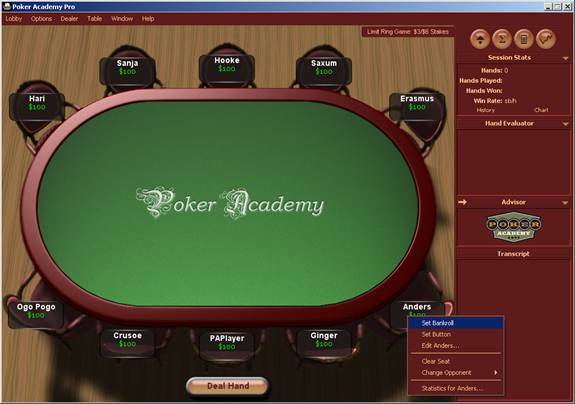 The online play option allows Poker Academy Professional 2.0 users to meet online, either to play against others, or only with friends. You can set any number of options to the room, and after creating the room, When playing one always has the option to show either card or both before mucking. All respectively broken down according to dollars won, SB/hand, showdown%, etc. Not to mention with graphs per position, per types of hands (any ace, pairs, suited connectors, etc.). There is also a funny curiosity due to a new improvement. 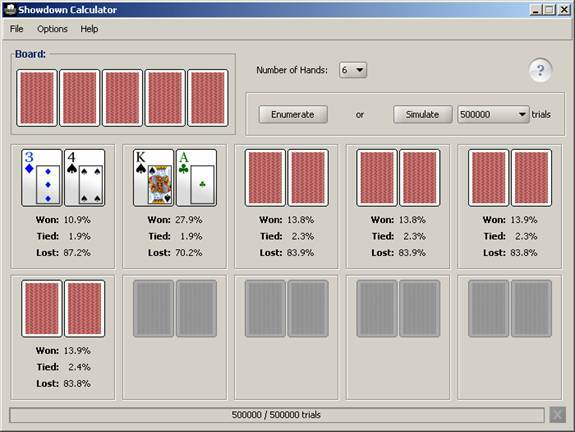 It shows the winning % in a showdown, so that under the players' hands one can see the chance to win according to the cards and flop, changing as each card appears. The curiosity is when one opts to use the playback for a session. When you play a session or tournament, you do not know what your opponents had nor their genuine winning chances if all the cards had been face up. Now, you can play a tournament, run the playback option, and see all the hands played, card-by-card (one can fast-forward, pause, etc), with all the cards face-up and all the respective winning chances under each player's cards according to each fold and card that appears on the board. Not only will you see who played what and the bluffs, but what your chances really were at each moment of the poker game. There are a number of small improvements that make training sessions much more interesting and productive. Of course, there was the usual 'Zip' button to immediately accelerate play to the next deal, after one had folded, but now there is the auto-zip so that this is a default choice.